Shakespeare’s Romeo and Juliet is known by many – the tragic tale of two star crossed lovers who fall victim to a bitter rivalry between their families. It is not the Italian town of Verona where our story of love and rivalry is set but in Alford, Aberdeenshire at the Castle of Craigievar, with the Montagues and Capulets replaced with the Clans of Forbes and Gordon. William Forbes of Menie, aka ‘Danzig Willie’ to his fellow clansmen (Danzig was his sea port of choice), made his living as a merchant importing wood from the Baltic region. Forbes’ fruitful career allowed him to purchase Craigievar Castle in 1606 after the Mortimer Clan went bankrupt and could not maintain the castle or estate. (The property stayed in the Forbes Clan’s possession for 350 years until it was gifted to the National Trust for Scotland in 1963.) Forbes wanted his wealth reflected in the castle and he set to work making everything much grander than ever imagined. The upper floors increased in size, being supported by carved corbels with turret tops, creating the magnificent pink turrets you can still see today. By 1612 the exterior castle work was finished, but Forbes desired a fashionable interior as well. The ceilings were decorated in plaster, modeled from those that can be seen at Edinburgh Castle by James VI of Scotland and I of England. Expert artisans in plaster work traveled all the way from Italy to complete the work shortly before Forbes’ death. The magnificent plaster ceilings can still be seen today. The rivalry between Clan Forbes and Clan Gordon was a long and endless stream of battles with records of the feud starting in the 16th century. In the 1520’s there were murders on both sides, the most significant being Seton of Meldrum who was a close comrade to the chief of Clan Gordon. Throughout the century the rivalry only heightened which led to more clans getting involved and choosing sides, strengthening each side and the rivalry. There were two full scale battles in 1571 between the two large cohorts of clans – the Battle of Tillieangus and the Battle of Craibstone. The battles were part of the Marian civil war in which the Clan Forbes supported the King and Clan Gordon supported the Queen. The 6th Lord Forbes’s youngest son known as Black Aurther Forbes was killed at the Battle of Tillieangus and they lost 60 men in the first hour of Craibstone. It took two Acts of Parliament for the clans to put down their arms. Despite this the rivalry and fighting continued into the 17th century, setting the scene for the mythic story of Scotland’s Romeo and Juliet. Willie Danzig’s grandson named ‘Red’ Sir John Forbes for his fiery red hair and violent ways, had a daughter who fell in love with a young member of the rival Gordon Clan, and much like Romeo and Juliet their love was forbidden. 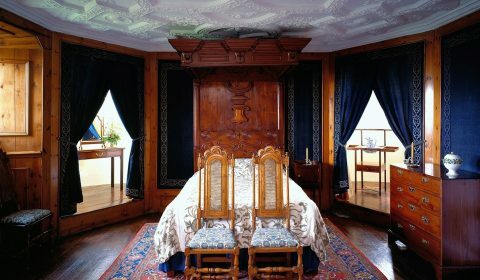 One evening the young Gordon boy, not caring for what this might mean for the feud, climbed to the ‘blue bedroom’ of the castle to see his love. To his surprise, he ran right into Red Sir John. There would be no exception to the rivalry between the clans, not even for his young daughter. Red Sir John made sure of this and lunged at the Gordon’s son with his sword (some say it went through his neck) and the young man tragically fell out the window to his death. The Forbes family continued to live at Craigievar for many years and much like the Montagues and Capulets, unsure of how it all began, their rivalry lived on too … even possibly into the afterlife. Throughout history visitors and guides at the castle have reported supernatural experiences, including mysterious footsteps on the stairs, and feeling the presence of ghosts at Craigievar. Rumors tell that these are the lingering spirits of Clan Forbes and Clan Gordon. Perhaps it is more specifically the Gordon son, still searching for his love on the same staircase where he fell to his death nearly 400 years ago. Or, perhaps it is Red Sir John who haunts the blue bedroom, angry at the stories being told about him? 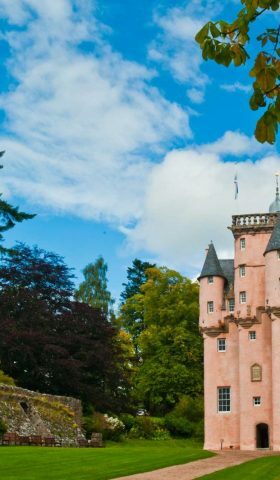 The castle is a fine example of Scottish Baronial architecture and paired with its beautiful surroundings Craigievar Castle looks like it should be the home of a Disney Princess. In fact, it is rumored that Walt Disney saw pictures of Craigievar and that they were part of the inspiration for his design of the iconic Disney Castle. This may be a myth in itself but it is easy to see why it might have been, with its pink walls and turrets, Cinderella would have fit in perfectly. Although, as you now know, the story of the Forbes and the Gordons holds far from a Disney fairytale ending. At the end of the Forbes residence Craigievar Castle was in disrepair. The Trust was gifted the property in the 1960’s and tasked with the necessary restorations. Craigievar was a home and it is the special family atmosphere that endears it to so many visitors and which the Trust has worked for decades to restore and preserve. 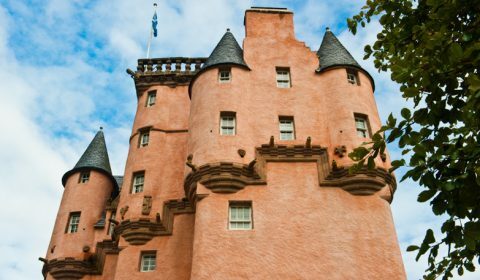 After two years of being closed for major conservation work, Craigievar Castle re-opened to the public in the spring of 2010. Daydream of starring in a fairytale or a myth of clan rivalry on this virtual tour of Craigievar Castle. Several years ago Drum Castle, another NTS property, used the science of dendrochronology – a technique of dating events, environmental change, and archaeological artifacts by using the characteristic patterns of annual growth rings in timber and tree trunks. 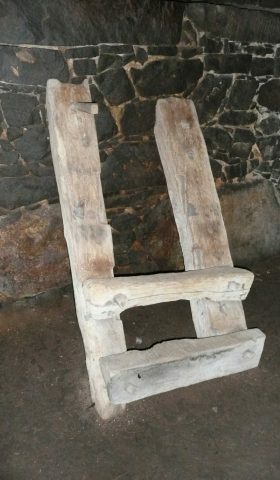 The conservation assessment revealed that the steps within the castle dated to the medieval period – much earlier than previously thought and possibly making it the oldest existing stairs in Scotland! Funding from a generous American donor made this important archaeological discovery possible. This year, the Trust will seek the expertise of conservators to examine a large fragment of a sturdy oak door that once formed the entrance to Craigievar and could date to the 16th or early 17th century. At the same time, the science will be used to study a rare set of six roofs at Sailor’s Walk in Kirkcaldy, Fife, that may also date to the early 17th century. The Foundation needs your help today to reveal the secrets of Craigievar’s past. Your contribution will provide critical funding to the dendrochronology study.